More than 55 community members came together Saturday to help beautify the entrance to Boulder City and made the first Community Cleanup Day a success. Celia Shortt Goodyear/Boulder City Review Community members clean up the corner of Boulder City Parkway and Buchanan Boulevard on Saturday for the first Boulder City Community Cleanup Day, hosted by the Chamber of Commerce. 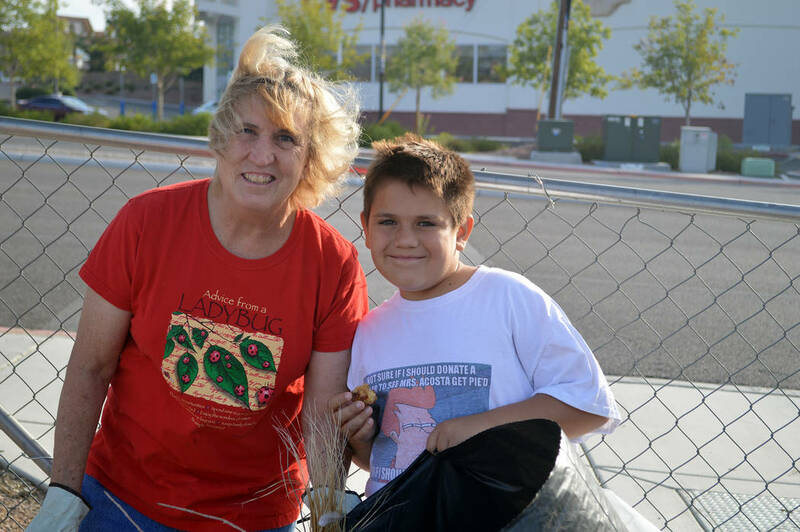 Celia Shortt Goodyear/Boulder City Review Boulder City resident Janet Denning and her grandson Agustin Acosta participated in the first Boulder City Community Cleanup Day on Saturday. 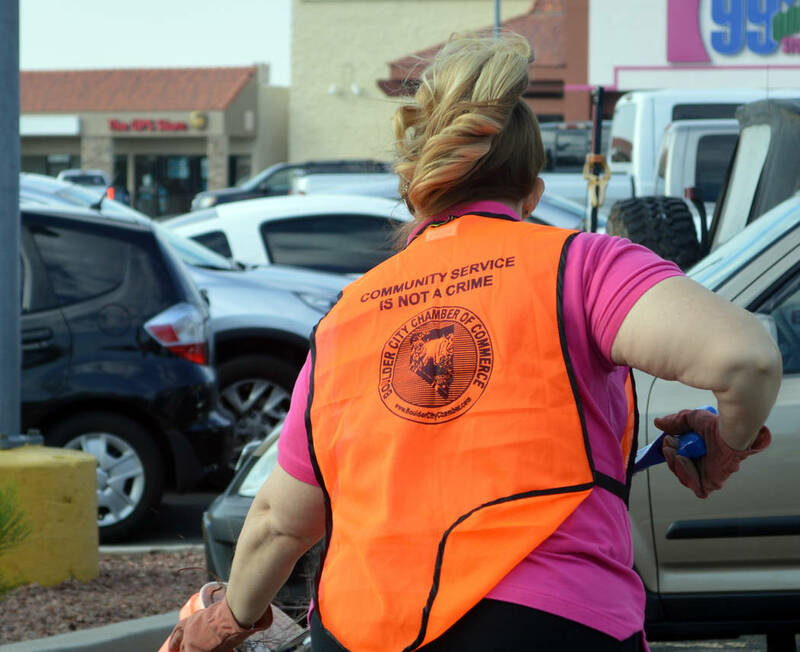 Celia Shortt Goodyear/Boulder City Review "Community service is a not crime" is a saying Chamber of Commerce CEO Jill Rowland-Lagan adopted and had put onto safety vests for community service activities including the recent Boulder City Community Cleanup Day on Saturday. Celia Shortt Goodyear/Boulder City Review Residents gathered many bags of debris and garbage residents during the Boulder City Community Cleanup Day on Saturday. 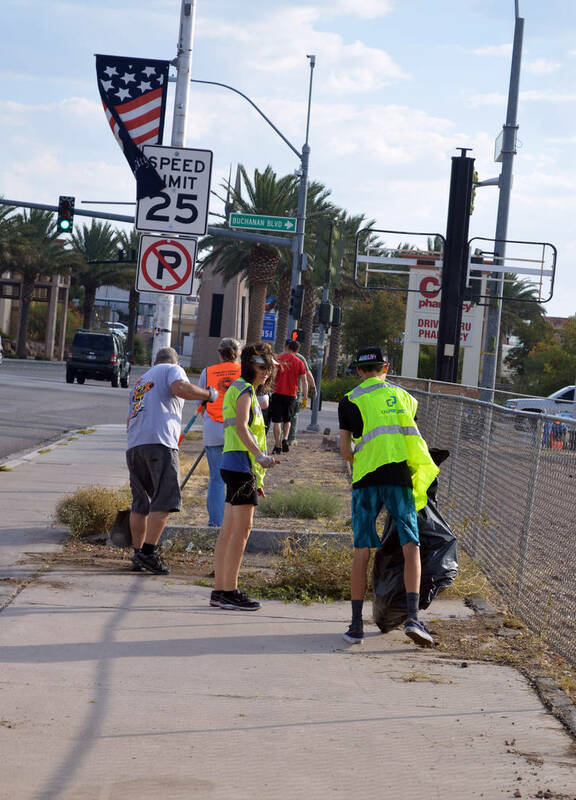 Boulder City Chamber of Commerce CEO Jill Rowland-Lagan created the cleanup day, which began at the corner of Buchanan Boulevard and Boulder City Parkway, after residents had said the streets coming into town looked bad. “I volunteered to organize an event to get residents to come about and be a part of the solution. … It is heartwarming to take pride in our community, so I’m happy to see this come to fruition,” she said. 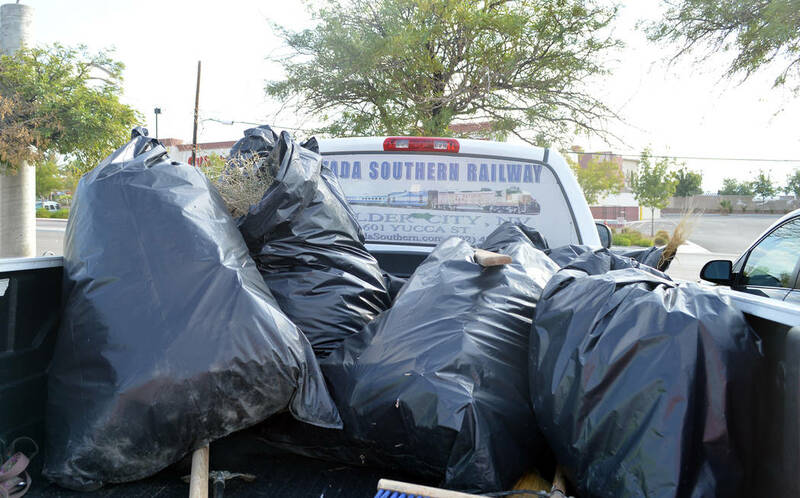 On Saturday, community members of all ages and backgrounds spent several hours clearing away weeds, trash and recyclable items along Boulder City Parkway. They started at the corner of Buchanan Boulevard and Boulder City Parkway and headed west. Fifth-grader Agustin Acosta came to the cleanup day with his grandmother, Janet Denning, after she found him playing on his Xbox. He said that this kind of event was a good idea because it is good for the city. Coincidentally, Saturday was National Cleanup Day. Rowland-Lagan said the cleanup included everything from syringes to a jockstrap as participants covered both sides of Boulder City Parkway from Buchanan Boulevard to McDonald’s and the four corners of the intersection. In total, they gathered two pickup truck loads of trash and a half a load of recyclable materials. Downs said that she participated Saturday because Rowland-Lagan does a lot for the community, and she wanted to support her projects. “If a community is cleaner, I’m more likely to stay longer and spend more money,” she added about when she travels to other places. Rowland-Lagan said that her favorite part of the day was everyone asking what comes next and telling her that they would be there whenever and wherever it was. Due to the event’s success, she said she plans on doing more community cleanup days, most likely on a quarterly schedule and in different areas of town.